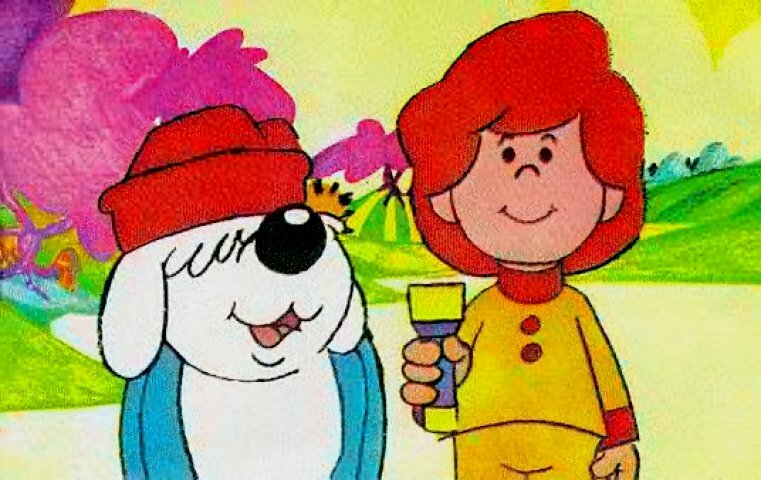 The J Programmes - Kids TV - Classic programmes from yesteryear. Jackanory : This programme ran for years and provoked huge outcries once taken off the BBC. Classic children's stories read by stars of stage, T.V. and film. I'm sure there is a site somewhere that lists the readers and stories so if anyone could point me in the right direction, I'd be grateful. Video - Jan Franics reads "Peter Pan"
Jaime and the Magic Torch : You can't mention this programme without someone trying to sing the theme tune. Down the helter-skelter, faster and faster towards cuckoo land. Wordsworth the dog. The torch was more useful than a Swiss army knife. Every kid had a programme they really looked forward to, this was mine. James The Cat : The continuing adventures of a black and white cat. I LIKE FAME, MONEY AND ALL OF THAT! CHASING BIRDS AND BUTTERFLIES - JAMES THE CAT! Jason Of Star Command: A generic space hero starman pilot bloke. Used to be on on Thursday's after Sport Billy. The programme also starred a Mad Professor played by the man who was the mad professor in "Street Hawk". Jayce and the Wheeled Warriors : American cartoon set in a future Universe, where Jayce, a young man, battles against the monster minds. The Monster minds were created in a lab accident by Jayce's father. Jayce leads the Lightning League who pilot well armed, sentient vehicles which have natty names like "quick draw" and "Drill Sergent". Can't remember whether he ever finds his father though! 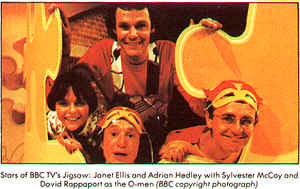 Jigsaw : Janet Ellis (later to become pregnant on Blue Peter), Adrian Headley, Jig.there was also Mr.Noseybonk (ooer) who I'm sure used to get chased around like Benny Hill (except there were no nurses, nuns or blokes with bald heads), Biggum, Wilf Lunn (The Mad Inventor - thanks for the name correction) and the O-Men who were played by Sylvester McCoy (Dr Who) and David Rapparport (Time Bandits). Jimbo and the Jet Set: Who were the jetset? I don't remember seeing them? Jimbo was a small plane (looked big enough for about 8 people) who lived at an airfield with plenty of other planes but was younger and smaller than them but nevertheless got the staring role. Always in lots of scrapes and things and was not at all a rival to Thomas The Tank Engine. Oh no! Johnny Briggs : Young boy, scrapes, top theme tune. Like Grange Hill, would become a breeding ground for actors later to appear in Casualty and Eastenders. Jossies' Giants : Football's just a branch of science. A group of lads coached by a former footballer. The best episode was when a group of Italian kids turned up and nicked the "women" of the Giants. As usual though the brand of acted football was awful. Jungle Ted : This was a tea-time show, around the same era as Calimero. Jungle Ted was a sort of fuzzy felt Tarzan, and he knocked around with a squad of animals known as the Lacy Button Poppers.